Research just published by Dr Dawn Rose at Herts University points to new ways that learning an instrument benefits children: it improves their 'fluid intelligence' and emotional wellbeing - and much more. But it's not just kids who benefit. Last September I picked up my flute for the first time in 30 years (I dropped it because I didn't have time to practice with three kids) and joined a class playing traditional folk tunes. We're encouraged to play by ear, which is a steep learning curve if you're used to relying on written music. But it's so worth it. When I've stopped banging my head against the wall in sheer frustration I can almost feel my brain synapses connecting - or whatever it is synapses do. Afterwards my brain feels as if it's had a complete physical work out: exhausted but flexing new muscles. And it doesn't stop there. Between classes I feel the benefits in so many other areas of my life: there's a new energy, a new clarity. Beats Sudoku any day. But this one has taken a while to dawn on me. Our sensible grubby roomy hatchback is redundant. The big boot is surplus to requirements. Now I can drive the car I've always dreamed of. It's a strange one for me, because I'm a rubbish driver. I have panic attacks just thinking about the M40. But I had a Damascene moment when I climbed into my friend's sporty BMW last week. Her only regular passengers since her kids left home are her two teeny terriers. I know it sounds sad, but bowling down the country lanes went straight to my head. It felt a bit Thelma and Louise, the sort of thing women with no responsibilities do. Suddenly I thought, if I had a car like this....or the vintage Triumph Herald I dreamt of as a student... or any car I chose because I loved it, not because it was big enough and safe enough - maybe I could conquer my fears of the M40. Because come to think of it, it was driving with a baby in the car that gave me the panic attacks in the first place. I'm so addicted to alcohol that I used to give it up for Lent. This year, partly because my daughter was doing dry January, I decided to get the agony over with quickly. I really hate not drinking, and I give up with gritted teeth (poor husband). Every evening I distract myself with elderflower cordial, peanuts, the Twin Peaks box set and a late-night cup of cacao. There's no way I'm going out to dinner with no wine. Eleven days in and I'm pulling it off - just one lapse so far. It was the day my daughter left home for good and I needed consolation. So why give up something you love so much? Simple: clarity and energy. Drinking was taking up so much of my time and draining my energy. Why squander the new levels of energy you get when your kids leave on a habit? This is something you only really recognise when you give up for a bit. What's helped me a lot is to stop feeling guilty about how much I drink - thanks to the hypnotherapist Georgia Foster, who has written a great book on the subject. She doesn't believe most people have to give up completely, and she doesn't make you feel guilty about drinking. She just offers manageable strategies to help you control your drinking, not the other way round. Oh, and the other thing that's really helped are Wet Weekends! I'm a freelance journalist and author of three non-fiction books. 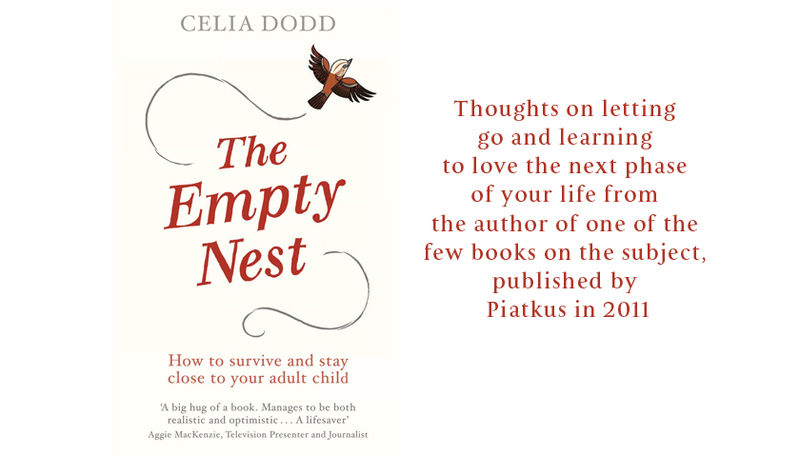 My last book was 'The Empty Nest: how to survive and stay close to your adult child'. I started writing it when the eldest of my three kids left home ten years ago. There didn't seem to be much advice around so I interviewed other parents to find out how they felt. I soon discovered that the empty nest affects mothers - and fathers - in all sorts of different ways. Moving on to the next stage of life can be a huge challenge - it certainly was for me! But it's turned out to be more fulfilling and exciting than I ever imagined. The new book I'm working on is a total departure! It's the biography of a former Brixton gunman and Sound System legend called Naptali who was shot five times and spent half his life in jail.